OK, this is so wrong in so many ways, it might just be right. After tasting all the success Syracuse has to offer a young filmmaker, Ryan Feaster decided it was time to make his talent available to the folks out in Hollywood. His offer, as his page on the MySpace explains it: "To convince a well-known and as-yet-unnamed Hollywood movie producer to grant me a production meeting -- where I will present him with a 3-film over 4-year movie deal!" And how will he convince this producer to take said meeting? Easy. By blogjogging the 2,950 miles from Syracuse to LA. But wait, there's more! Because last week [day 44, Mount Moriah, Missouri], Ryan's support van driver had to head back to Syracuse, leaving Ryan to complete the trip alone. Alone and pushing all his gear in a B.O.B. Ironman jogging stroller. I know what you're thinking: who's he want to meet? what're the movies about? Did he fire his driver/cinematographer for shooting into the sun? How's the stroller performing? My real concern--besides the fact that he's crazy, of course [which doesn't bother me; he'll fit right in in L.A. I remember an environmentalist announcing a hunger strike to protest my client, the then-new Dreamworks' plan to build its studio on some wetlands. He told the radio guy he wasn't going to eat until he got a meeting with Spielberg, and the entire population of LA let out a giant "Bwaha!" and then silently wished they'd thought of that.] --is, "will he get his Stroll-Smart shipped in time to cross the Rockies?" My guess would be he's pitching an adaptation of Handcarts to Zion. I thought at first that he actually had a kid in there. Then I realized that he was just using it as a shopping cart. It made my respect for him go down a bit. 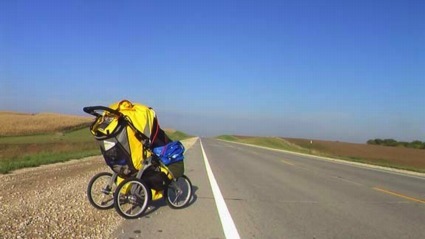 I mean he's crazy, but jogging across the country with a kid in a stroller? That would be true insanity. Not only does Walmart let you "camp" in their parking lot, they apparently let you park your permanent home on wheels in their parking lot for years on end. At least if you live in the super expensive bay area housing market like I do. bleh. I think i've been staring at the same 4 super sized RVs in my local Walmart parking lot for about 2 years.